Planning covers a very broad range of issues, but is essentially about the decisions that change the environment and affect everyday life. Decisions like new public transport, the size of a new shopping centre, the location of parks, a bike path or a new road. Planning decisions influence how we get to work or school, where we shop, and what we do in our spare time. Under Victoria's planning system, local councils and the State Government develop planning schemes to control land use and development. Planning schemes are also developed to ensure the protection and conservation of land in Victoria in the present and long-term interests of all Victorians. Planning schemes are developed in accordance with planning policies and strategies. They contain planning policies, zones, overlays and other provisions that affect how land can be used and developed. Everyone can be involved in planning and influence the creation of planning policies. The Planning on a Page poster (PDF, 1.3 MB) shows how everyone can be involved and how these policies are translated into planning controls. 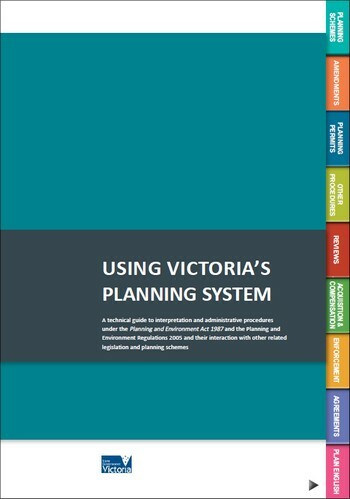 Using Victoria's Planning System is a more detailed guide for people who use the planning system on a regular basis. It may also be useful for people who use the planning system infrequently. This guide is designed to help professional planners, local council and referral authority officers, councillors, students, people applying for a planning permit, and people who may be affected by a planning proposal. It is a technical guide about planning schemes, the Planning and Environment Act 1987, and the Planning and Environment Regulations 2015, and also explains the interaction with other related legislation. To be advised of updates to Using Victoria's Planning System, you can subscribe to our free weekly email alert, Planning Matters. The guide applies to the preparation and application of a planning scheme provision in Victoria. It is primarily intended for use by planning practitioners considering or preparing a new or revised provision for a planning scheme. A series of planning practice and advisory notes are available to assist users of the planning system. They are generally aimed at planning professionals, but they can also be useful for people who only occasionally use the planning system. 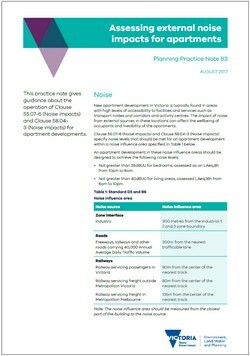 Practice Notes relate to a range of planning processes and topics, including preparation of planning scheme content, assessment of permit applications and provide ongoing planning advice. Advisory Notes relate to changes to specific subjects and new initiatives and are current only at the time of publication. More guidance documents about particular planning topics are available on the relevant pages on this website.